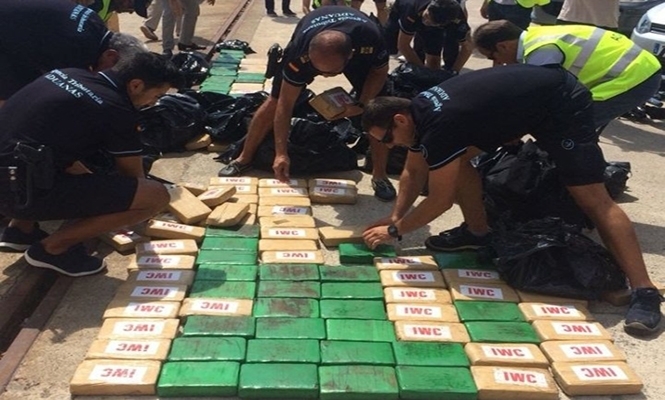 SPANISH police and customs officers have made a dramatic swoop on a luxury UK-registered yacht in their biggest-ever drugs bust in the Balearic Islands. Over 300 kilos of cocaine was recovered from the boat that was reportedly flying a Gibraltar flag. Five crew members arrested when police intercepted that had been under surveillance for some time. Customs officers and police spotted the yacht positioned 15 miles off the Ibiza coast at the weekend and the yacht’s crew were seen fishing out suspicious packages from the sea. Authorities are aware of these “drop-off” tactics, which feature smaller boats gathering small amounts of a larger shipment, and then ferrying the narcotics to shore in small, concealable amounts. Police found 150 kilos of high purity cocaine tethered to the ropes and a further 150 kilos stashed onboard beneath the captain’s cabin. The total value of cocaine seized is estimated to be worth €16.7m (£15m). The five crew in police custody are believed to be one German and four Dutchmen. “Operation Haircut” remains an open case as police look to make more arrests of individuals connected to cocaine smuggling in Spain.